"Bureaucracies hide their mistakes, because people's careers are tied to those mistakes. Therefore, bureaucracies are a perfect mechanism for perpetuating mistakes." 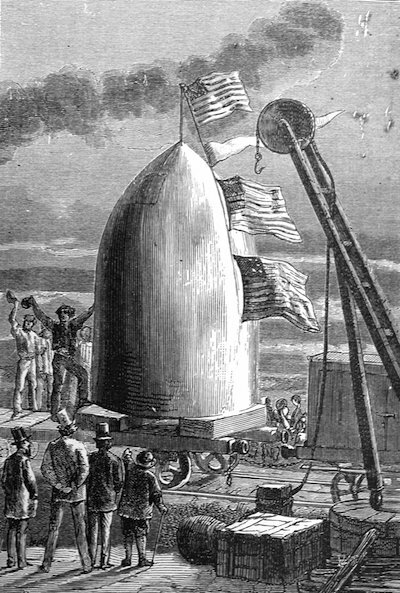 A projectile, or shot, capable of enclosing passengers and being safely hurled to the moon by an enormous cannon. A great cannon having been cast and placed in the soil of Florida, what sort of projectile could be used to send several intrepid passengers to the Moon? The projectile had now to be filled to the depth of three feet with a bed of water, intended to support a water-tight wooden disc, which worked easily within the walls of the projectile. It was upon this kind of raft that the travelers were to take their place. This body of water was divided by horizontal partitions, which the shock of the departure would have to break in succession. Then each sheet of the water, from the lowest to the highest, running off into escape tubes toward the top of the projectile, constituted a kind of spring; and the wooden disc, supplied with extremely powerful plugs, could not strike the lowest plate except after breaking successively the different partitions. Undoubtedly the travelers would still have to encounter a violent recoil after the complete escapement of the water; but the first shock would be almost entirely destroyed by this powerful spring. 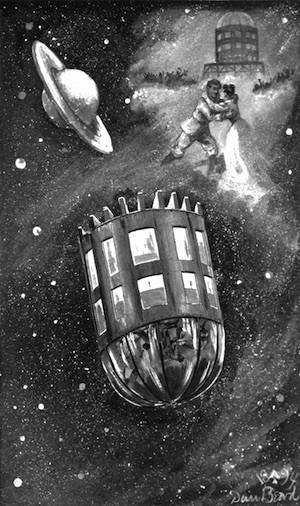 The upper parts of the walls were lined with a thick padding of leather, fastened upon springs of the best steel, behind which the escape tubes were completely concealed; thus all imaginable precautions had been taken for averting the first shock; and if they did get crushed, they must, as Michel Ardan said, be made of very bad materials. The entrance into this metallic tower was by a narrow aperture contrived in the wall of the cone. This was hermetically closed by a plate of aluminum, fastened internally by powerful screw-pressure. The travelers could therefore quit their prison at pleasure, as soon as they should reach the moon. Light and view were given by means of four thick lenticular glass scuttles, two pierced in the circular wall itself, the third in the bottom, the fourth in the top. These scuttles then were protected against the shock of departure by plates let into solid grooves, which could easily be opened outward by unscrewing them from the inside. Reservoirs firmly fixed contained water and the necessary provisions; and fire and light were procurable by means of gas, contained in a special reservoir under a pressure of several atmospheres. They had only to turn a tap, and for six hours the gas would light and warm this comfortable vehicle. 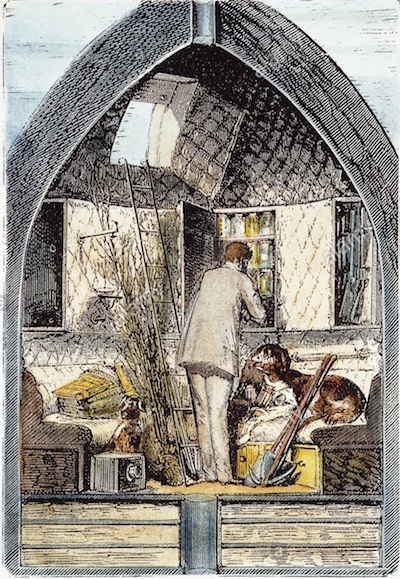 There now remained only the question of air; for allowing for the consumption of air by Barbicane, his two companions, and two dogs which he proposed taking with him, it was necessary to renew the air of the projectile. Now air consists principally of twenty-one parts of oxygen and seventy-nine of nitrogen. The lungs absorb the oxygen, which is indispensable for the support of life, and reject the nitrogen. The air expired loses nearly five per cent. of the former and contains nearly an equal volume of carbonic acid, produced by the combustion of the elements of the blood. In an air-tight enclosure, then, after a certain time, all the oxygen of the air will be replaced by the carbonic acid-- a gas fatal to life. There were two things to be done then-- first, to replace the absorbed oxygen; secondly, to destroy the expired carbonic acid; both easy enough to do, by means of chlorate of potassium and caustic potash. From From the Earth to the Moon, by Jules Verne. That, and the few comforts required by gentlemen, are all that are needed! This illustration accompanies an 1880 Pall Mall Gazette article about Verne's work. The first truly scientific work on space flight was not published until Konstantin Ziolkovsky (Tsiolkovsky) published his seminal paper "Exploration of Space With Reactive Devices" in 1903. He showed how a rocket ship could be used to send humans beyond Earth orbit, and included calculations that led him to believe that multiple-staged vehicles would increase the payload (the Chinese had experimented with this idea earlier). NASA paid to translate all of his works into English in 1965. Dream Of Building Your Own Rocket?